Well yes I did it again!!! Another STAR CARD!! I thought this card was a lot different from the other Star Cards I have been making..well a bit different, so I just have to show you. I started with a Baked Brown Sugar Base and Mossy Meadow Matt. I liked how the background came together on this one. First up I stamped the Hardwood Stamp in Baked Brown Sugar to give a grungy wood effect to the card stock. On the Mossy Meadow piece I decided I wanted to have the words Season's Greetings embossed in silver all over the entire sheet. (like a piece of designer paper). Don't you just love stamps...they give you so many options. The Star from the Bright and Beautiful Stamp set was stamped in Baked Brown Sugar and cut out with the Star Framelits. so I had to make her something special for her big day. Shannon loves black and white (this could well be the colour scheme for the wedding) and so I made a Birthday Card in a Box for her. Lots of flowers from the Flower shop stamp set stamped in black on white card stock and silver embossed on black card stock and white card stock, and punched out with the Pansy Punch. The greeting on the front was from Tag Talk and punched with the matching Label Bracket punch. I layered it onto a 2 inch black circle and a 2 3/8 inch Scallop circle in silver glimmer card stock. I added a couple of butterflies from the Papillion Potpourri Stamp Set and matching butterfly punches. The designer paper is non-SU. Needless to say she loved her card. On another completely different note...I just wanted to show you the cute little thank you cards I made for my SU customers last week as well. Absolutely no stars today!! haha. Instead I had a birthday card to make last week and decided to pull out the Apothecary Art stamp set as I hadn't used it in a while. Isn't that pretty? Blackberry Bliss with Pink Pirouette! 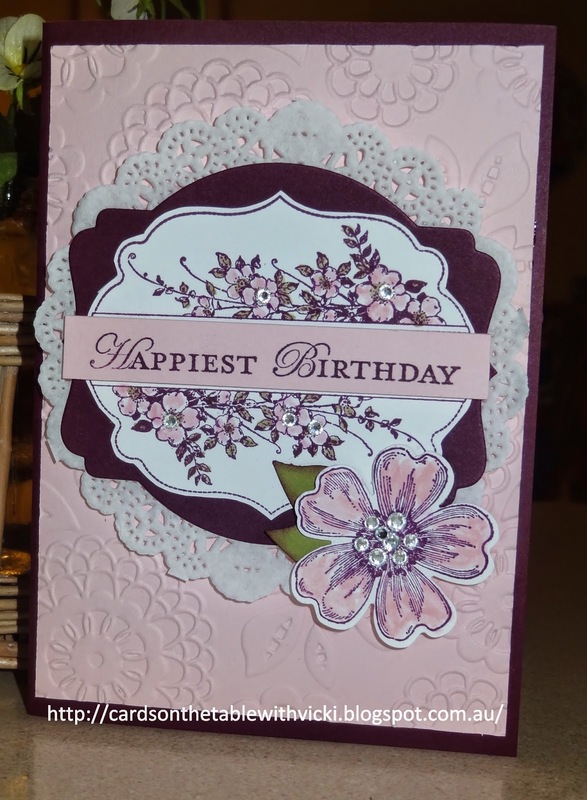 The Pink Pirouette card is embossed with I Love Lace embossing Folder. The Apothecary Art Stamp is cut out with matching Labels Collection Framelit. Underneath that I added a Blackberry Bliss Deco Framelit and a paper lace doily. I coloured in the flowers with Stampin Up Pink Pirouette Pen and Old Olive Pen. I couldn't resist adding a flower from the Flowershop stamp set in the corner. The leaves are from the Bird Builder Punch (bird wing). Lots of lovely diamantes finished off the flowers beautifully. This was such a lovely card to make. I am thinking a few more of these wouldn't go astray. As promised I have my favourite Star Card to show you today. This one is just a little different from the rest and I am sure you will see why. 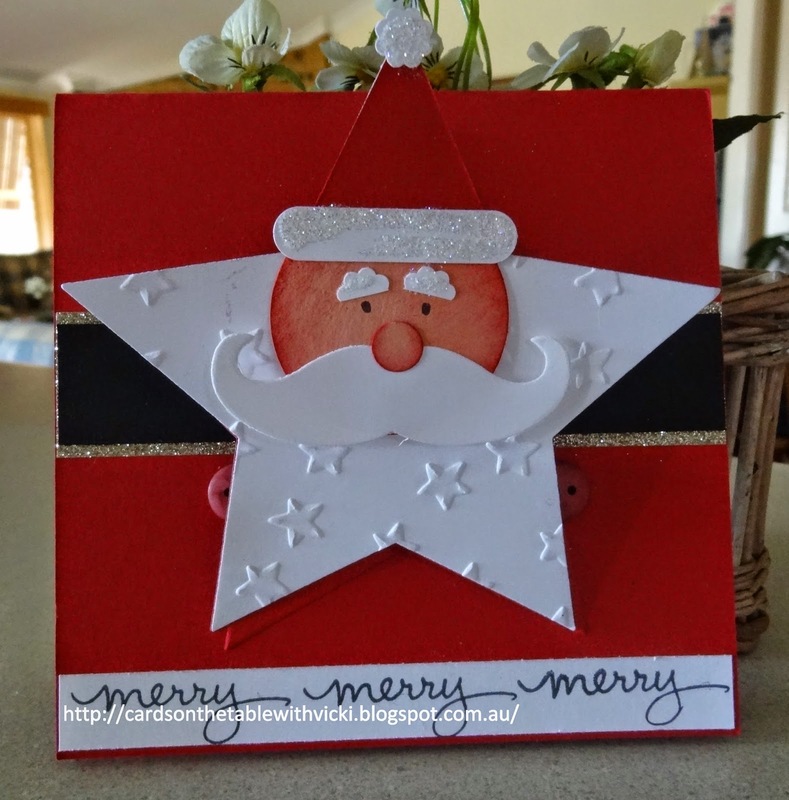 This is a Santa Star Easel Card. The Santa stands up like this. And then the whole card opens up as well. Ta Da!! The Santa wasn't too hard to make. Just fold a piece of Real Red Cardstock in half and cut out the star shape with your Star framelit just over the edge of the fold (so the star stays together). 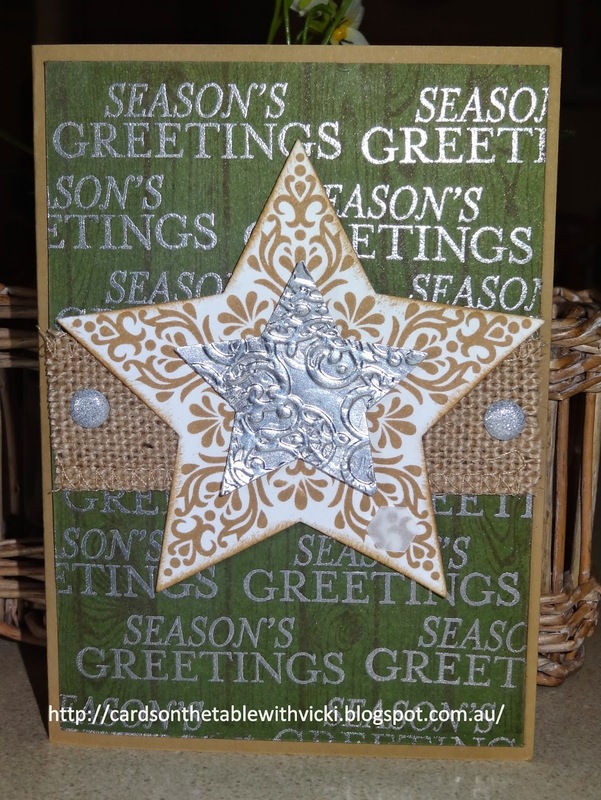 The bottom star glues directly to your card and the top star is folded in half to stand up. Here is a side and view. Stick you Santa Star onto the front half of your star. I did add a small piece inside to reinforce the fold. OK I know you are thinking I must be going Star-Crazy !!! haha! But each time I finish a card I have just one more Star left-over and it is begging to be used! Have a look at what I mean. I used Pool Party Cardstock and some All is Calm Designer Paper. I cut some stars out of the designer paper with the Star Framelits and the mini star punch. 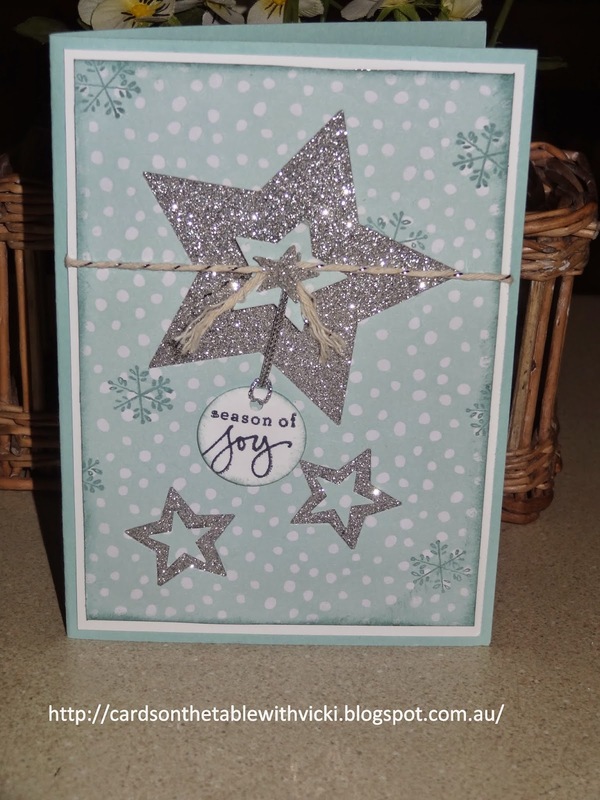 Adding some silver glimmer card behind the cut out stars really made them sparkle. Do you like the little tag? It is made with Endless Wishes greeting punched out with the circle punch. So after I had made this super quick card. 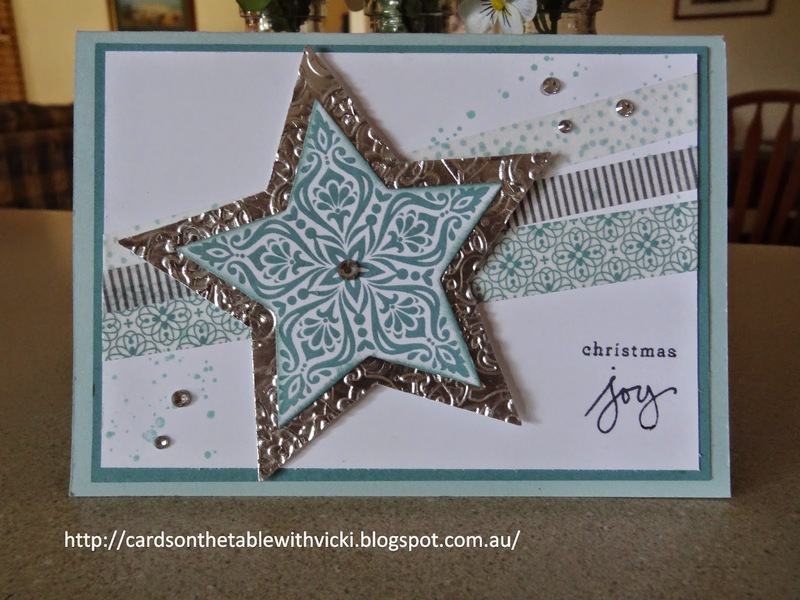 I had a lovely Star cut from the All is Calm Designer Paper still on my table. What could I do but make another card with it. This time I went with a Country Christmas style using Baked Brown Sugar Cardstock for my base. I stamped the Star from Bright and Beautiful Stamp set in Whisper White Craft Ink. (use the heat tool to set the ink). Then popped the star on top. As you know from my last post. 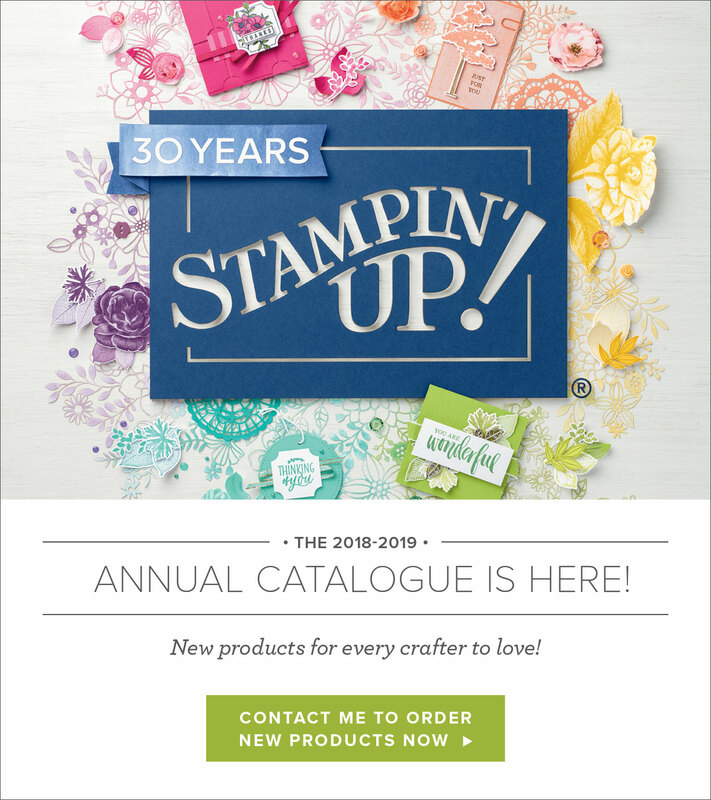 I have been having a great time with the Bright and Beautiful Stamps Set from the Holiday Catalogue and the matching Star Framelits(main catalogue). Here are a few more cards I have made with them. This one is nice and easy. 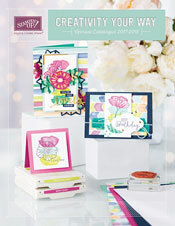 Cardstock: Pool Party, Lost Lagoon and Whisper White. I used the All is Calm Washi Tape diagonally across the Whisper White piece of card stock. Stamped some Gorgeous Grunge spots in Coastal Cabana Ink in the top and bottom corners. The Star is stamped in Lost Lagoon ink on Whisper White and layered on top of a Silver Foil Card which I embossed with a retired embossing Folder. The next card I absolutely love! I had this idea and just played with it. First I was going to make it into a tag but then I decided to add it to a card front. Come and see.